Lake Mead – August 2010 A two-mile extension of Pearce Ferry Road to the Colorado River opened on March 15, just in time to allow boat take-outs for the new river running season. Access to Lake Mead from Pearce Ferry closed in 2001 because of a severe drop in water elevation. Pearce Ferry Rapid, created when the river carved a deviation from the old channel through silt deposited by Lake Mead, continues to flip boats and offer other exciting challenges. The South Cover jet boat shuttle service that outfitters have used in the past to bring passengers the last 50 miles out of the Grand Canyon was stopped by the rapid. Now commercial jet boat shuttles are launching at the new boat ramp just above the rapid. —–Important new boat ramp regulations, a detailed map and information on the six-month construction project, may be found in the Lake Mead National Recreation Area and Grand Canyon National Park Press Release. Grand Canyon – August 2010 Fifty years ago on July 4, 1960, the first and only successful uprun of the Colorado River in Grand Canyon was launched. Logistically it was an extremely challenging undertaking that began in New Zealand as an idea hatched by two American friends, Phill Smith and Bill Austin. Their idea ended up as a major expedition on the Colorado with two key leaders, Bill Austin and seasoned river runner and historian Otis, “Dock” Marston. A preliminary downrun to test things out resulted in an unfortunate accident and injury to Bill Austin who had to be transported out to a hospital by Air Force helicopter. —–Nine men, the youngest of whom was sixteen, took four boats on the now historic uprun through the rapids. 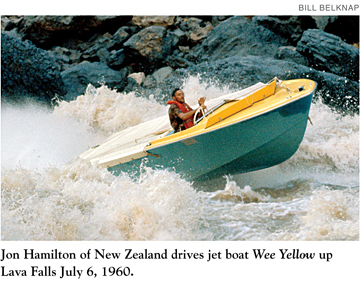 Lava Falls was their greatest challenge, but the Kiwi, Wee Red, Wee Yellow and Dock, eighteen-foot fiberglass boats provided by the trip sponsors, the Buehler Corporation of Indiana, were all piloted through 16,500 cfs of raging water at Lava by New Zealander Jon Hamilton, the most skilled boatman on the uprun crew. —–Only seven men made the entire uprun. Those who did complete it were Jon Hamilton and Dock Marston in the Kiwi, Guy Mannering, Bill Belknap and Jim Bechtel in Wee Red, and Buzz Belknap and Ed I‘anson in the Dock. They reached Lee’s Ferry on July 12, 1960. 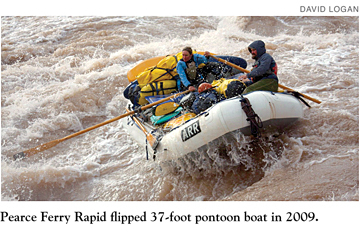 After one of the boats—Wee Yellow—sank at Grapevine Rapid, Fireball Young and George Morrison, both Bechtel employees, chose to go out on mules from Phantom Ranch. —–The uprun was a daring and amazing way to introduce a revolutionary new device to the public, but it worked. An article in the National Geographic and worldwide publicity gave a jump start to the export of a seemingly simple innovation. Sir William Hamilton, a New Zealander who was eventually knighted for his gift of tinkering with Archimedes’ law, as he would later explain, had devised a way of ejecting the water sucked into a jet pump in the back of a boat from a position above the water line, instead of below it, thereby increasing speed. Today if you take a ferry from Hong Kong to mainland China, or a jet boat shuttle at the end of your Grand Canyon trip, chances are a HamiltonJet waterjet makes the high speed ride possible. —–For more information about the international use of the Hamilton Jet units today visit the HamiltonJet Website. Nathaniel Galloway, Emery and Ellsworth Kolb, Bert Loper, Julius Stone, Charles Russell, Norman Nevills, Dock Marston, Georgie White…. The intrepid men and one woman who pioneered whitewater boating on the Colorado River as we know it today are no longer with us, but some of their boats are! 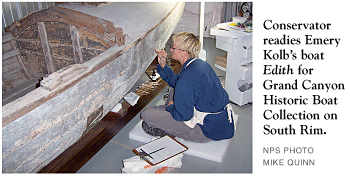 —–The ‘Stone’ boat, the Edith, the Wen, the Wee Red, the Glen, the Esmeralda II and other boats that once plied the rapids are being painstakingly restored by the National Park Service for a display in a new museum projected to open on the South Rim by 2015. The boat display site for the Grand Canyon River Heritage Museum will be a 7500-square foot structure located south of Bright Angel Lodge that served as a laundry building during Fred Harvey heydays at the Canyon. The project is an ambitious but heartfelt undertaking supported by a coalition of seven private organizations, associations and trusts at the Grand Canyon. Glen Canyon Dam releases for the month of August are projected to peak at 16,500 cfs in late afternoons. Early morning lows will be 8,500 cfs. The average release for the month of August is projected to be 13,000 cfs or 800,000 acre-feet. —–Lake Powell’s reservoir level has continued to climb this summer and as of August 1 was 3,637 feet or 64% of capacity. This level is 63 feet below the maximum elevation of 3,700 feet. In recent years, Lake Powell reached a low elevation of 3,555 feet (33% of capacity–155’ below maximum lake elevation) on April 8, 2005. —–Lake Mead’s reservoir level as of August was 1,087 feet, 40% of capacity or 142 feet below maximum lake elevation of 1,229 feet. By September Lake Mead’s level is projected to be 1,083 feet or 146’ below maximum lake elevation. —–Lake Powell has continued to rise over the last 5 years while Lake Mead has continued to suffer extreme low water levels. Travelers in the west this summer and fall have an opportunity to see one of the world’s most amazing engineering feats in progress. The Hoover Dam bypass project, scheduled for completion this year, is expected to have traffic traversing it by November. As of August 2010, the Colorado River Bridge, a centerpiece of the project spanning Black Canyon, downstream of Hoover Dam, was nearly complete. —–In the meantime river runners heading east from Las Vegas/Boulder City to Pearce Ferry, Diamond Creek or outfitter launch or pickup points via the South Rim should plan ahead for continuing delays on the old Highway 93 route. Daytime traffic delays from Boulder City to Kingman may be up to three hours. For up-to-date information on the Hoover Dam Highway Bypass, go to www.hooverdambypass.org.